Not to be confused with Clock-Watcher. 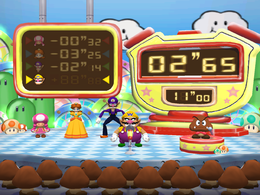 Clock Watchers is a 4-Player Mic minigame found in Mario Party 7. It's very similar to the Duel minigame Time Bomb from Mario Party 2. Its name comes from the word "clock" and "watch"; both devices measure time. The crowd cheers as the players run onto the stage. A time will be shown on a large clock. The players have to say "Stop" into the Mic after said amount of time has passed. The player who comes closest wins. However, after three seconds, the time will disappear, forcing players to keep track of it themselves. The Goomba-filled audience cheers as the winner does his or her victory animation. Rules – "Stop the timer as close to the target time as you can." Advice – "Once the timer disappears, keep counting in your head." This page was last edited on February 19, 2018, at 00:44.